Contemporary 85m² apartment with one bedroom, an additional high-quality sofa bed and a private bathroom, welcomes you in a spacious living/dining area with kitchen equipped with high quality appliances. The flat benefits from excellent natural light throughout the day. 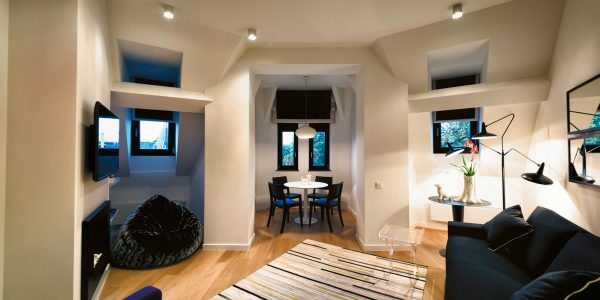 Modern and uniquely decorated, the apartment is dominated by typical alcoves which give a warm-hearted ambience in the living area. Fully equipped, the dining area is spacious and has a pleasant wood kitchen design with large dining benches –ideal for family gathering or events. Carefully decorated in natural tones, the living area has a unique aura – providing comfort and charm with its wooden parquet floors, large convertible sofa and its original decorative fireplace around the convertible sofa. Quiet and well-lit, the bedroom has a queen sized bed and large wardrobes. The apartment offers bathroom vanities with an Italian shower and separate toilets. 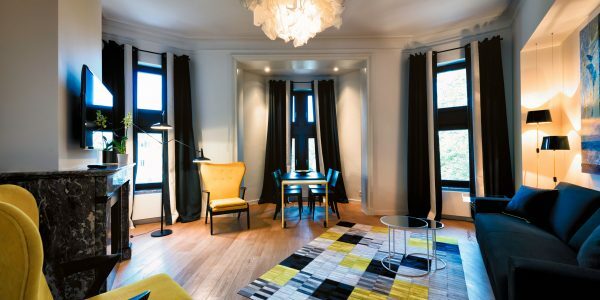 Elegant Top-Floor Apartment – One bedroom – In the heart of the European District of Brussels Elegant 60m² top-floor apartment ..